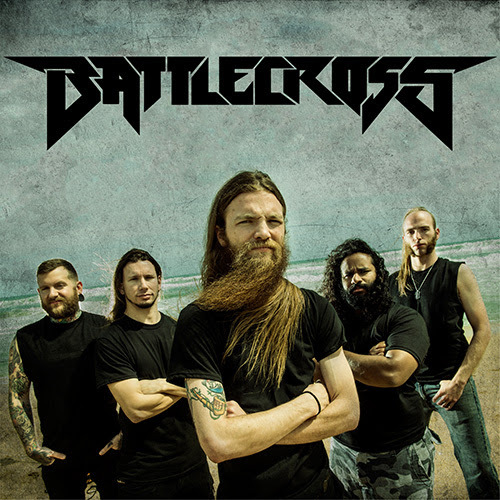 Battlecross released a new cover of Slayer’s War Ensemble. The track will be streaming via Metal Hammer UK & Metal Hammer Germany beginning May 27 and will later be made available to fans via iTunes. It was recorded, mixed and mastered by Matt Dalton at 37 Studios in Rochester Hills, Michigan. The band recently kicked off a North American tour with Killswitch Engage and Trivium that wraps up at the end of May, then the band ventures to Europe in June for a series of festival appearances, as well as club shows with Huntress. War of Will, the band’s most recent album, debuted at #134 on the Billboard Top 200 chart, #118 on the top current albums chart, #2 on the heatseeker chart, #15 on the current hard music chart, #16 on the hard music overall chart, and #32 on the independent albums chart. It didn’t stop here though, as the band also debuted in Canada’s Soundscan charts coming in at #178 Top 200 Current and #25 Hard Music Charts while also landing on the iTunes charts for release date at #103 Top 200, #10 on Rock, and #2 on Metal. This marks the band’s first ever Billboard chart debut. War of Will also peaked at #3 on the US iTunes metal chart on the day of release. This entry was posted in METAL and tagged BATTLECROSS, Hiran Deraniyagala, Huntress, Jeff Hanneman, Killswitch Engage, Metal Blade, Metal Hammer, Seasons in the Abyss, Slayer, Trivium, War Ensemble. Bookmark the permalink. TWRradio – Behind the scenes. Enter your email address to follow TWR.com and receive notifications of new posts by email.